Charlotte, NC (Shawbears.com) — Both teams shot poorly in the first 20 minutes, as combination of poor shots and stifling defense took center stage. With the win Fayetteville State improves to 12-15 overall, while the Shaw Bears end the season with a 14-13 overall record. Fayetteville State held the high powered Shaw bears to their lowest scoring point total of the season at 49 points. These two teams split during the regular season — each winning on their opponent’s floor. As both teams struggled to put points on the board in the first 1:36 seconds, Shaw was able to get on the board first, when DeAngelo Stephens-Bell would make two free throws for games first points. Russell Robinson added five points. Benji Bell and Larry Richardson had three points each. Michael Tyson scored nine points to lead the Broncos of Fayetteville State, while Joshua Dawson, Isaiah Vinson and Willie Gilmore added three points each. In the second half, Fayetteville State’s Joshua Dawson became more aggressive with the ball, and finished the afternoon going an impressive nine of 10 from the free throw line. The Broncos used a total team effort win the game, as they got contributions from five players who ended up in the final boxscore in scoring. FSU’s Joshua Dawson was money from the free throw line in the final minute, as he would make six of six coming down the final stretch. The contest features one lead change, and four scoring ties throughout the forty-minutes, and the Broncos scored 13 points off Bear turnovers, while Shaw managed 11 points. Fayetteville State also outscored the Shaw Bears in bench points, 11 to nine. The Broncos also outrebounded the Shaw Bears, 40-29, and outscored the Bears 36-31 in the second half to come away with the win. DeAngelo Stephens-Bell cut the FSU lead to one, at 21-20 on a layin early 2nd half, but the Broncos answered by a Willie Gilmore three pointer with 15:45 left to play. Shaw’s Benji Bell hit a basket at the shot clock buzzer to make it 26-24, but Willie Gilmore answered for FSU with a three of his own to give the Broncos a 29-24 advantage. FSU moved to a 31-24 advantage with 12:00 minutes left, but Shaw would get score from Russell Robinson and answered by William Tibbs with a score inside to push the score to 33-26, with the Broncos holding the lead. Both teams would get scores going back and forth for the next several minutes, before DeeAngelo Stephens-Bell would pick up the and one, and with the made free throw, made the score 44-41, with 2:45 remaining. Joshua Dawson would go the free throw line and would make one of two free throw to move the score to 45-41. Shaw’s Benji Bell would come down and hit a three ball but Fayetteville State answered again with a Michael Tyson with the score inside. DeAngelo Stephens-Bell would get the old fashioned and one, but he would misses the free throw. Fayetteville’s Joshua Dawson would hit a huge three to push the score to 50-46 with under a minute left. Dawson would go four for four in the final 30 seconds from the charity stripe, and DeAngelo Stephens-Bell drove the ball but was blocked with 35.3 left. He would grab his own board and was fouled. Stephens-Bell would make tow of two form the line, but coming down to the other end of the floor, the Bears would put Joshua Dawson back at the line with 33.1 remaining. Larry Richardson would hit the jumper to pull Shaw to within, 54-49, with 19.9 left, but Joshua Dawson would put the game away from the line, as the Broncos would advance, 56-49. Fayetteville State was led by Joshua Dawson, who finished with 17 points, six rebounds and two steals. Michael Tyson added 13 points and 10 rebounds, and William Tibbs added 12 points, nine rebounds and three assists. Willie Gilmore chipped in 11 points and added three rebounds. 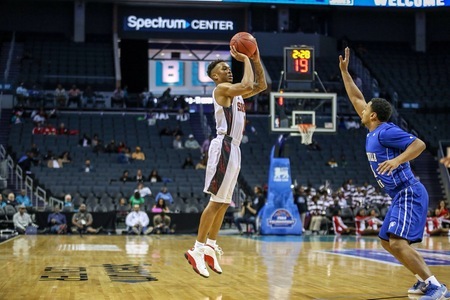 Shaw University was paced by DeAngelo Stephens-Bell who finished with 17 points and eight rebounds. Benji Bell added 11 points and four rebounds. Fayetteville State will now advance to play the winner of tonight’s 9 p.m. game, between #3 Winston-Salem State and #2 Virginia State University.